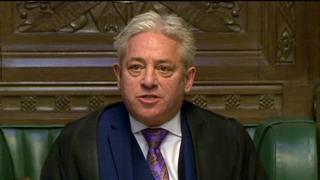 Commons Speaker John Bercow has criticised David Davis over his role in the release of Brexit impact papers. He ruled that the Brexit secretary was not in contempt of Parliament. But he said Mr Davis's decision to "unilaterally" cut out parts of the papers was "most regrettable" and he had been too slow to release them to MPs. Labour claimed Mr Davis was in contempt for making misleading statements and trying to block the papers' release. Mr Davis released an 850-page dossier of information outlining the economic impact of Brexit on 58 different sectors of the economy to MPs - but not the public - after a binding vote in the Commons last month. 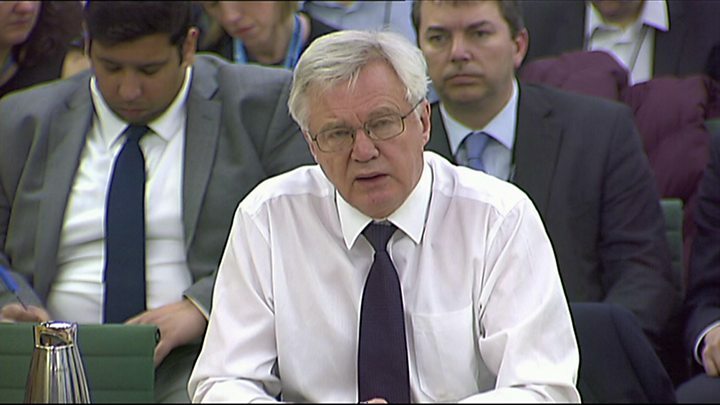 But he faced criticism after an appearance before the Exiting the EU committee in which he had admitted his department had carried out no formal impact assessments, despite previous statements Labour said had suggested otherwise. Mr Bercow said: "Ministers could, with advantage, have been considerably clearer in their statements - particularly in challenging lines of questioning in select committees which were based upon a genuine misconception." But he said the test for contempt had not been met. Some MPs also wanted Mr Davis reprimanded for contempt over claims he had dragged his feet over the publication of the reports after Parliament had ordered him to do so on 1 November. The Speaker said: "While it was most regrettable the Secretary of State - a point I made to him privately, I now state publicly - unilaterally excised some material from the papers which he provided, and that it took so long to provide the papers, I also feel bound to pay due attention to the formerly recorded view of the (Exiting the European Union Select Committee) that the Secretary of State had complied with the order of November 1." A secure reading room has been established to allow MPs and peers to read the impact statements - but Conservative MP Sarah Wollaston said they should be released to the public. "I recently booked an appointment in the reading room and I thought it'd be like an inner circle of hell, that I'd be trapped in there for days to read the sector analysis," the chairwoman of the health committee told MPs. "In fact, there are only nine pages on health and social care and the entire documents relevant to my select committee took me less than an hour to read. "I do feel, in the interests of transparency, these are very straightforward documents and they should be in the public domain." The government has argued that the documents contain information that would undermine Britain's negotiating position in Brussels. Brexit minister Robin Walker told MPs some them would be "of certainly great interest" to the EU. Mr Davis was also accused of patronising an MP, during Brexit questions in the Commons, after he suggested she should ask for a dictionary as a Christmas present. Labour's Rupa Huq asked Mr Davis: "What is the difference between an impact assessment and a sectoral analysis?" Mr Davis, in his reply, said: "She perhaps ought to put in her Christmas list for a dictionary." Labour's Mary Creagh could be heard saying: "Patronising." Mr Davis went on to explain what he saw as the difference between the two terms.